Bonjour! 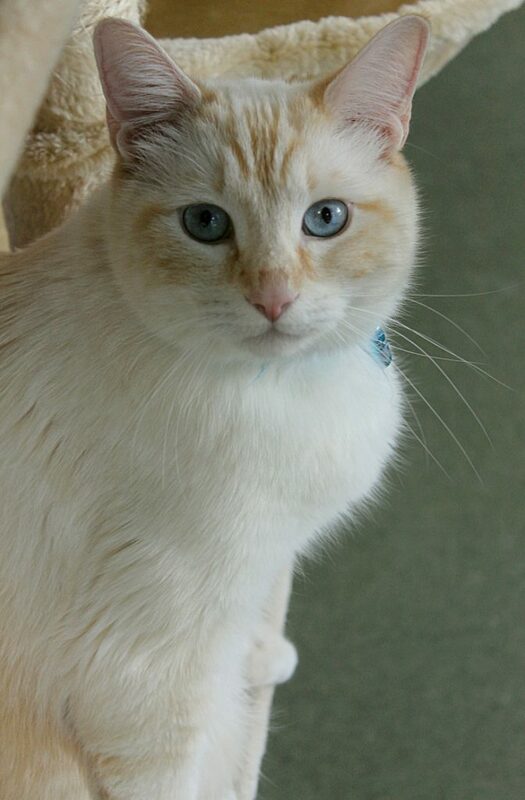 My name is Perrier and I am a sauve 6-year-old gentleman with gorgeous flame-point Siamese markings. I’m pretty chill for the most part, and spend most of my time soliciting attention before putting serious effort into my mid-morning, afternoon, or evening naps. I just am a big lover man with an independent side — mostly when I’m asleep! I have lived around other kitties my entire life and while I tend to live peacefully around them, I certainly wouldn’t mind having my own kingdom to rule. Whenever folks visit, I’m always the first one to ask for attention and am not afraid of interrupting your time with another kitty — they’re not as handsome as I am, after all! I can be pretty chatty — especially when I’m hungry — and I will ask you for pets and to sit down so I can jump up and rub up against you. I seem very curious about dogs and would probably be a nice feline companion for a cat-friendly dog. I am a hearty and healthy young man and am pretty low-maintenance! I just need some affection and admiration, a decent dinner, and a sunny spot on the carpet to lay in, and I’m one happy kitty! Are you looking for a kitty like me? I’d love to meet you! Come down to Pixie today! I come to you fixed, vaccinated, and micro-chipped for an adoption fee of $100.